Located in the popular city of Lee’s Summit, Missouri, the subdivision of Deerbrook North consists of attractive single family homes with spacious interiors and outdoor space. A perfect place for families to buy a home, this neighborhood brings together the convenience of living within close proximity to a variety of shops and restaurants with the benefits of living in a family-friendly atmosphere. Homebuyers will love the single family homes for sale in Deerbrook North, with spacious homes listing in a price range of $100,600 to the low $200,000s. These affordable real estate options cater to families interested in living in a peaceful and safe environment, and this family-friendly area is very popular with homebuyers. The close proximity to MO-291 also adds to the appeal of this location, and allows busy families to easily travel to and from school and work. One of the most desirable features of the Deerbrook North community is the quality of its schools. 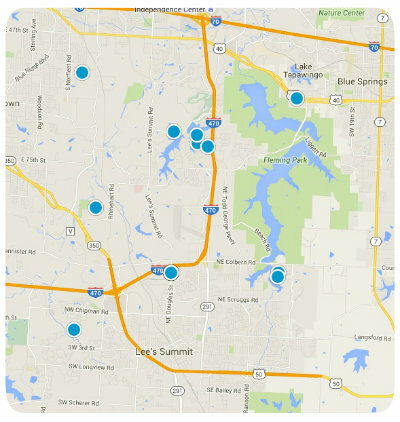 Included in the Lee’s Summit School District, public schools in this area are celebrated for their great scores and educational programs. The Meadow Lane Elementary School and Campbell Middle School are local options for younger children, while the excellent Lee’s Summit North High School provides older students with the education they need to succeed. The nearby Lee’s Summit downtown district is the heart of the Lee’s Summit community, and offers many unique shops and restaurants, as well as events like the annual Homecoming Parade. Deerbrook North’s great Lee’s Summit location makes it a great place to buy a home. For more information about buying a home in the Deerbrook North neighborhood of Lee’s Summit, Missouri, please contact us today!